On November 15th sculptor Brian Christensen will install five outdoor works on the Snow College campus in Ephraim. Entitled Reinterpretation, the show, says Christensen, "is based on reinterpreting and finding meaning in materials with a previous functional life and history. Each piece has elements that evoke a shadow of its past life. These elements are blended with associations drawn from my own memories and history in a sort of reincarnation." Reinterpretation is a common theme throughout Christensen's work. 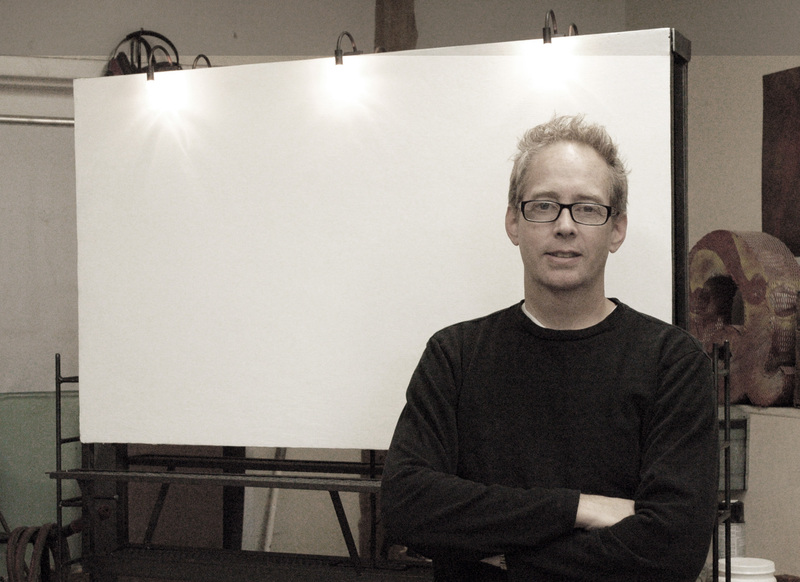 Where many artists identify themselves with a specific medium, the BYU sculpture professor says he's simply an artist who responds to ideas. "I'm not super tied to a medium. I guess you'd say I'm more of just a general artist than I am a sculptor even," he says, "because I'll get an idea that I want to put across and I'll use whatever medium comes up." As a child in San Diego, Christensen showed an early interest in art and imagined himself becoming a painter. But even at a young age he showed interest in a variety of working methods. His first exposure to 3D processes came from the shop where his dad worked as a dental technician. "That was always just a fun thing for me to go there, and my dad showed me processes of various kinds for fabricating things," he says. Christensen moved to Provo at age 13 and continued taking art classes, but it wasn't until he enrolled at BYU that he was reintroduced to the possibilities of 3D art, primarily through ceramics professor Von Allen. "Sort of a light went on that my way with things was working with materials, and clay in particular," Christensen says. "I fell in love with how clay could look like absolutely anything. It can be made into things. It can be made into a painting. It's somewhere in between a paint and sculpture material, because you can literally liquefy it and paint it onto something, or it could be hard and sandable, or it could be pliable. There's just all these aspects of it." With his newfound interest in clay, Christensen completed his BFA in ceramics in 1990, and went on to receive an MFA in ceramics from Washington University in St. Louis in 1993. Shortly thereafter he began teaching at BYU, where a new world of materials opened up to him. "I got my job at BYU right out of grad school, and right away when I had a shop available to me, I started expanding the menu of materials that I use, so that now I'll use casting of various kinds, using anything from plastics to bronze." 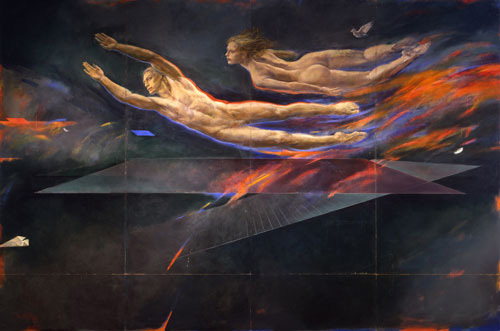 On the wall opposite UMFA’s entrance, looming over passageways leading to various destinations, the monumental painting Flight Aspiration can be seen almost as Trevor Southey conceived it for the Salt Lake Airport. Four horizontal figures fly from right to left across its surface: a man facing towards us, a women turned away, a bird, and a paper airplane captured in exquisite three-dimensional perspective. All four naked, someone quipped. Southey, who has seen this object of scandal only in photographs in the almost thirty years since it was taken from public display, muses on the difference between the photograph and the real thing. “I had begun to think it might actually be a bad painting. But now that I see it for real again, I think it’s good.” Perhaps this unexpected humility is the most striking thing about meeting Trevor Southey. Again and again we point something out to him, and inevitably he agrees. This is the first time he—or anyone—has seen his entire career laid out more-or-less chronologically, and he has readily accepted the view of it created by his friend Day Christensen, who was asked to curate the show because of his familiarity with the man and his aesthetic sense and has hung it with great sensitivity to both the individual works and their cumulative impact. Somehow, this artist has managed to work for half a century without falling back on the self-protecting ego on which so many depend. The sudden freeing up of strictures on artists in the Modern Era didn’t require the simultaneous devaluing of those skills that had reached an apotheosis in the Victorian era. There ought to have remained room for someone like Bouguereau or Sargent alongside Toulouse-Lautrec, Pollock, or Warhol. But there wasn’t. More than just realistic representation, drawing skills, structural knowledge, and even a taste for beauty all became cause for suspicion if not outright dismissal. That the result was a devaluing of working skills in the artist has long been obvious, but the simultaneous effect on the audience’s ability to appreciate art has been overlooked. So walking through the half-dozen rooms at UMFA where Trevor Southey: Reconciliation will remain until February 13th comes as a shock: not the shock of outrage or flat disappointment one often feels, but the shock of realizing how low our expectations have fallen. Month after month, we in the art audience visit and revisit contemporary shows, comparing and gauging works not just against each other, but against what we flatter ourselves are absolute, objective standards. And then along comes some blockbuster show full of famous names to reveal how crippled the standards are by which we are accustomed to judging.